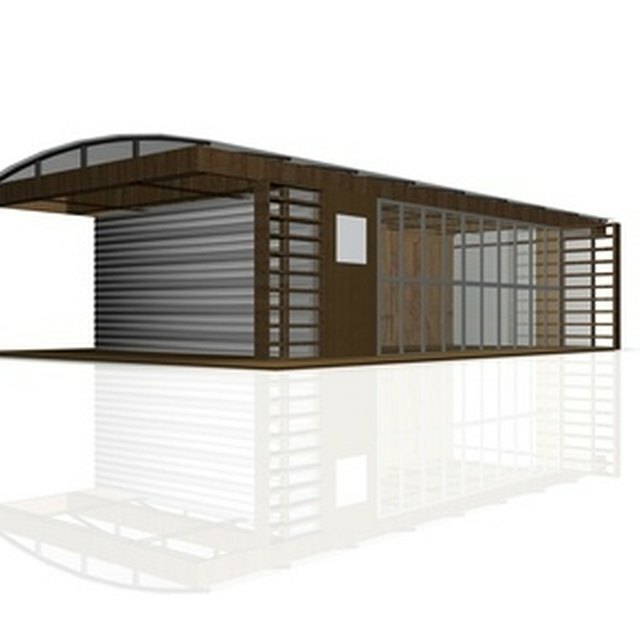 Constructing a good-size single garage can leave room for a workshop or storage. While you have options on dimensions, plan a couple of extra feet for wall storage or a work bench space. When you add just two additional feet, for example, you are really adding many additional cubic feet. Keep in mind that a single-car garage with storage space will enhance the market appeal of your home. The back wall of this garage might yield needed storage. The average size of a single-car garage is about 12 feet wide by 22 feet long. While many homeowners add a couple of extra feet in length or width, you can house one car in this average garage. It's possible to make the length only 20 feet, but 22 feet offers more options for storage and shelving in the back of the space. If the budget and the lot size will allow, you will find the garage more user-friendly if you build it 14 feet wide to allow for side storage and opening car doors more easily. Storage ideas can fit different layouts. For instance, you can build overhead storage in the roof, especially if the roof is 10 feet high or higher. Garage attic space should be reinforced, however, because storing a lot of weight there can make joists sag. Floor-to-ceiling storage shelves along 18 inches of the garage's back wall can work, too. Or, if you build a couple of extra feet of width onto the garage, you can construct a storage wall and workbench in a single-car garage. Make sure your exterior garage design fits the home's architecture. You want the roof of the garage and overhangs to blend with the house overhangs and roof angles. In other words, the garage construction should look original to the house. Try to avoid constructing a garage that looks added on later, if at all possible. A bump-out storage room or greenhouse is possible. On the back wall of the garage, you can construct a lean-to shed addition for storage. Or, you can install a lean-to greenhouse, for example, on the back wall exterior. In a narrow yard, adding this kind of space to a single-car garage is especially good for those who enjoy gardening. You simply don't have as many storage options inside a single-car garage as you do in a standard two-car garage. A small garage should fit your lifestyle. You can install a breezeway between the garage and house in just four or five feet, for example. A door leading to the breezeway from the garage will provide a breezeway patio, perhaps, to place muddy boots. Or, you can install a small table to park bags of groceries for transport into the house. Having an automatic garage door opener and automatic light inside the garage can enhance your single-car garage as well. Cost Helper: How Much Does Building a Garage Cost?